2. Department of Respiratory Diseases, Ningbo No.2 hospital, Ningbo, China. Asthma is a chronic respiratory disease characterized by airway inflammation and remodeling, resulting in a substantial economic burden on both patients and society. Deguelin, a constituent of the Leguminosae family, exhibits anti-proliferative and anti-inflammatory activities in cancer mice models via inhibiting phosphatidylinositol 3-kinases and the NF-κB pathway. We demonstrated that deguelin effectively reduced OVA-induced inflammatory cell recruitment, decreased lung tissue inflammation and mucus production, suppressed airway hyperresponsiveness, and inhibited serum immunoglobulin and Th2 cytokine levels in a dose-dependent manner in asthmatic mice. In addition, we found that deguelin reduced inflammatory gene expressions both in vivo and in vitro, which were closely associated with activation of the NF-κB signaling pathway. Thus, we further explored the underlying mechanisms of deguelin in normal human bronchial epithelial cells (BEAS-2B). Our results suggested that deguelin inhibited NF-κB binding activity by enhancing the ability of IκBα to maintain NF-κB in an inactive form in the cytoplasm and preventing the TNF-α induced translocation of p65 to the nucleus. In conclusion, our research indicates that deguelin attenuates allergic airway inflammation via inhibition of NF-κB pathway in mice model and may act as a potential therapeutic agent for patients with allergic airway inflammation. Keywords: Asthma, Deguelin, Inflammation, NF-κB pathway, TSLP. Asthma is one common chronic disease in the world that is characterized by chronic airway inflammation, mucus hypersecretion, and airway hyperresponsiveness (AHR), with a high incidence of about 334 million patients worldwide . Early life exposures, environmental impacts including bacteria, toxins, viruses and air pollution, as well as childhood obesity are significant risk factors for the pathogenesis of asthma . Accumulating evidence has shown that inflammatory responses of asthma are mediated by T-helper type 2 (Th2) cytokines including IL-4, IL-5, IL-9, and IL-13, which are critical for the synthesis of immunoglobulin IgE, the switch of T-helper cells toward the Th2 phenotype, and the survival of eosinophils . It has been suggested that alterations in cytokines network, including the overproduction of Th2 cytokines (interleukin [IL]-4, IL-5, and IL-13), the reduction in Th1 cytokines (interferon [IFN]-γ and IL-2), and abnormalities of IL-17, TGF-β, and thymic stromal lymphopoietin (TSLP), are involved in pathophysiology of asthma . A variety of innate immune cells, such as dendritic cells, mast cells, and epithelial cells, also contribute to the airway inflammation of asthma. Furthermore, nuclear factors, such as nuclear factor-κB (NF-κB) and GATA-3, have been shown to regulate asthmatic related genes . Although there are advances of understanding the mechanisms of asthma, effective therapies controlling the refractory asthmatic inflammation are still limited. Deguelin is a member of the rotenoid family, isolated from several plant species, including derris trifoliate and Mundulea sericea, which are members of the Leguminosae family. Previously researches have shown that deguelin can suppress the proliferation, invasion and migration of various types of cancer cells through down-regulating the activation of phosphatidylinositol 3-kinases (PI3K)/Akt, mitogen-activated protein kinase (MAPK), fibroblast growth factor receptor-4 (FGFR4), and vascular endothelial cell growth factor-D [6-9]. In addition, deguelin has been shown to down-regulate tumor necrosis factor-α (TNF-α) induced the NF-κB signaling pathway, which plays a critical role in the regulation of inflammation [10, 11]. Moreover, deguelin have been shown to exhibit anti-inflammatory activity through the suppression of lipopolysaccharide (LPS)-induced nitric oxide (NO)/inducible nitric oxide synthase (iNOS) expression . Although deguelin has been explored effectively in the cancer therapy, it is unknown about anti-inflammatory effects of deguelin in asthma. Thus, potential effects and mechanisms of deguelin in inflammation are still need to be illustrated. In the present study, we investigated anti-inflammatory effects and mechanisms of deguelin in a murine asthmatic model. We found that deguelin effectively reduced ovalbumin (OVA)-induced inflammatory cell recruitment, decreased lung tissue inflammation and mucus production, suppressed AHR, and inhibited serum immunoglobulin and Th2 cytokine levels and inflammatory gene expressions. In addition, we assessed the levels of NF-κB signaling molecules both in vivo and vitro with stimulation of deguelin, and found out that deguelin markedly inhibited phosphorylation of NF-κB p65 subunit and inhibitor of κBα (IκBα), reduced degradation of IκBα and nuclear translocation of p65. We demonstrated that deguelin attenuates allergic airway inflammation in a murine asthmatic model by inhibiting the activation of NF-κB pathway, and may be a potential therapeutic agent for asthma. Male BALB/c mice, 4-6 weeks old (weight 20 to 22g) and free of specific pathogens, were purchased from Shanghai Slac Laboratory Animal Co. Ltd (Shanghai, China). Mice were housed for 3 days to adapt themselves to the environment before experiments. Mice were housed in micro-isolator cages and received food and water ad libitum. Experiments in this study were approved by the Animal Experiments Committee of Zhejiang University, and were performed in accordance with the Chinese National Regulations for Animal Care. BALB/c mice were sensitized using an intraperitoneal (i.p.) injection of 25μg OVA (Grade V, Sigma-Aldrich, St. Louis, MO, USA) in 0.1 mL alum on days 0 and 14. On days 21, 22, and 23, mice were challenged by 2% OVA for 20 min in phosphate-buffered saline (PBS), using an ultrasonic nebulizer. Control mice were subjected to the same protocol, but received PBS instead of OVA in the challenge phase. Deguelin (purity>98%, power, Sigma-Aldrich, St. Louis, MO, USA) was prepared by dissolving in dimethyl sulfoxide (DMSO) with final concentration of DMSO to 0.1% (v/v). Deguelin (1mg/kg, 4mg/kg)  in 0.1 ml saline was given by intraperitoneal injection 1 h before each OVA aerosol challenge. Saline or dexamethasone (DXM, 1mg/kg) was used as a negative or positive control. The schematic diagram of the treatment schedule is presented in Figure 1. Experimental protocol for the development of allergic asthma and treatment with deguelin or dexamethasone (DXM). The mice were divided into five groups (n = 12 in each group) and sensitized to OVA on days 0 and 14. Subsequently, mice were intraperitoneally injected with deguelin or DXM 1h before challenged by 2% OVA for 20 min in PBS on days 21-23. Mice were sacrificed on day 24. Mice were anesthetized 24 h after the last aerosol challenge and BALF was performed as previously described . Ice-cold PBS (0.4 mL) was instilled three times into the lungs, and BALF was collected. The fluid recovered from each sample was centrifuged (4℃, 400 g, 5 min) to pellet the cells, and the supernatant was kept at -80℃ until it was used for cytokine measurements. Total cell counts were performed using an automated cell counter (Invitrogen, Waltham, MA, USA). The cell pellets were resuspended in PBS and differential cell counts were performed using the Wright's staining (BASO, Zhuhai, China) method. At least 200 cells were counted per slide by two researchers independently. Lungs were fixed with 10% formalin, embedded in paraffin, sectioned into 5μm slices, and stained with Hematoxylin and Eosin (H&E) (Sigma-Aldrich, St. Louis, MO, USA) for the detection of inflammatory cells and Periodic-Acid-Schiff (PAS) for analysis of mucus secretion in the goblet cells of the lung epithelium. The AB/PAS-stained epithelial areas of lung sections were captured using a light microscope (DP20, Olympus, Melville, NY, USA), and quantitative analysis was performed blinded as described before . AHR was assessed by whole-body plethysmography (Buxco Electronics, Troy, NY, USA) after the last OVA inhalation. Mice were placed in measured chambers. Aerosolized normal PBS or methacholine in increasing concentrations (3.125-50 mg/ml) were nebulized via chamber inlet for 90 s. Recording and baseline were averaged for 3 min after each nebulization of variant methacholine concentration. AHR was expressed as enhanced pause (Penh), a calculated unit-less value that correlates the airway resistance, impedance, and intrapleural pressure within the same animal. Total serum IgE, IgG1 and IgG2a levels were measured using the ELISA kits (eBioscience, San Diego, CA, USA), according to the manufacturer's instruction. Briefly, blood was collected 24 h after the last challenge. Serum samples collected from eyes after sacrificing were stored at -80℃ until measurement. The plates were coated with purified anti-mouse IgE, IgG1 and IgG2a, washed and blocked, and diluted serum was then added. Biotinylated anti-mouse immunoglobulins were used for detection of the antibody. Purified mouse immunoglobulins were used as the standards. After incubation with the substrate, the plates were read at 450nm using an ELISA reader (Bio-Rad, CA, USA). Normal human bronchial epithelial cells (BEAS-2B) were purchased from ATCC (CRL-9609, Rockville, MD, USA). BEAS-2B cells were plated into six-well plates at a concentration of 1×106cells/well and cultured in DMEM/F12 (Gibco, ThermoFisher Scientific, Waltham, MA, USA) containing 10% fetal bovine serum (FBS, Clark Bioscience, Houston, Texas, USA), supplemental with 100units/ml penicillin and 100ug/ml streptomycin (Sigma-Aldrich, St. Louis, MO, USA). Cells were cultured at 37℃ in 5% CO2 in a humidified incubator. The BEAS-2B cells were plated in 96-well plates at a density of 5×103 cells/well and treated with different concentrations of deguelin [10, 15]. After incubation for 24 h, cell viability was measured in triplicate using a Cell Counting Kit-8 (Dojindo Laboratories, Tokyo, Japan) according to the manufacturer's protocol. The absorbance value was measured at 450nm using a Microplate Reader (Bio-Rad, CA, USA) and the measured absorbance was converted to the percentage (%) of the control value. The concentrations of cytokines (IL-4, IL-5, IL-13 and IFN-γ) in the BALF supernatant were measured by sandwich ELISA kits (eBioscience, San Diego, CA, USA) specific for mice, following the manufacturer's instructions. The ELISA kits show no cross-reactivity with any of the cytokines tested at 50 ng/mL. The plates were read at 450nm using an ELISA reader (Bio-Rad, CA, USA). Total RNA from lung tissues and cells were extracted using TRIzol reagent (Takara Bio, Shiga, Japan), and finally diluted in nuclease-free DEPC-treated water. RNA quantity and purity were calculated using the absorbance at 260/280 nm value using a Nanodrop (Thermo Fisher Scientific, Waltham, MA, USA). For real-time reverse transcriptase polymerase chain reaction (RT-PCT) analysis, the following components were added to a 10μl reaction volume: 1μl of cDNA, 0.4μl of each forward and reverse primer (10μM initial concentration), 0.2μl of 50× ROX Reference Dye II, 3μl of PCR grade water, and 5μl of 2× SYBR Premix Ex TaqTM II (Takara Bio, Japan). The sequences of the primer pairs are listed in Table 1. PCR conditions consisted of one 30 s cycle at 95℃, followed by 40 cycles of 95℃ for 5 s and 60℃ for 34 s, followed by a melting curve analysis. PCR reactions and analysis were performed using a 7500 Real Time PCR system (Applied Biosystems; Life Technologies, Grand Island, NY, USA). The expression of target genes was calculated by the 2-△△CT method, and normalized to β-actin values. Lung samples were grounded into powder in liquid nitrogen, and lysed in ice-cold lysis buffer (2% Triton X-100, 10 mM Tris-HCl, pH 8, 150 mM NaCl, 2 mM NaN3, 2 mM EDTA) containing protease inhibitors for 2 h at 4℃. Cells were washed in PBS and lysed in ice-cold lysis buffer containing protease inhibitors for 1 h at 4℃. Lysates were harvested and centrifuged at 12000 rpm in a tabletop centrifuge to collect supernatant and were stored at -20°C until further use. The nuclear protein was extracted according to the manufacturer's protocol of NE-PER Nuclear and Cytoplasmic Extraction Reagents (Thermo Fisher Scientific, MA, USA). Protein concentration was determined using the protein assay kit (Thermo Fisher Scientific, MA, USA). Cell lysates and supernatants were electrophoresed in a 10% or 12% sodium dodecyl sulfate polyacrylamide gel under non-reducing conditions and were transferred to nitrocellulose. Western blotting was performed using antibodies against NF-κB p65 (Ser536), IκBα (Ser32) as well as phosphor-specific antibodies for NF-κB p65, IκBα (Cell Signaling Technologies, Beverly, MA, USA), and an appropriate HRP-conjugated secondary antibody (ZSGB-BIO, Beijing, China). Equal loading of the lanes was confirmed by analyzing the blots for β-actin and Lamin B expression using an anti-β-actin and anti-Lamin B antibody (Boster Biological Technology, Wuhan, China). Bands were detected using an enhanced chemiluminescence reagent. Grey values were measured with Quantity One software (Bio-Rad, CA, USA). Cells purified from mouse lungs were resuspended and stained with FITC-conjugated anti-CD4 (BioLegend, San Diego, CA, USA), APC-conjugated anti-TSLP Receptor (R&D Systems, Minnesota, USA), and the respective isotype control stains, according to the manufacturer's instructions (BD Pharmingen, San Diego, CA, USA). The fluorescent antibodies were added (1μg/100μL) and incubated for 30 min at 4 °C. Flow cytometry acquisition was performed using a FACS-Calibur (BD Bioscience, San Jose, CA, USA), and the results were analyzed using CellQuest software (BD Bioscience, San Jose, CA, USA). All data were presented as mean ± SEM. Statistical differences were determined by Student's t-test and one-way ANOVA with SPSS 19.0 (SPSS, Chicago, IL, USA). Values with P < 0.05 were considered statistically significant. To examine the possible anti-inflammatory effect of deguelin on allergic airway reactivity, we treated asthmatic mice with different doses of deguelin intraperitoneally, for three consecutive days before OVA aerosol challenge. BALF was collected 24 h after the last OVA aerosol challenge, and then total and differential cell counts were performed. 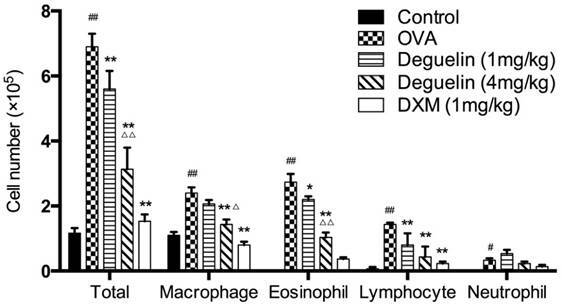 OVA-inhalation significantly increased total cell, eosinophil, macrophage, lymphocyte, and neutrophil counts in asthmatic mice compared to the saline challenged mice (Fig. 2). Both low and high doses of deguelin (1mg/kg, 4mg/kg) reduced total cell, eosinophil and lymphocyte counts compared to the OVA-challenged group (Fig. 2). Furthermore, the high dose of deguelin (4mg/kg) markedly reduced total cell, eosinophil and macrophage counts as compared with the low dose of deguelin (1mg/kg) (Fig. 2). Thus, these results suggested that deguelin reduced inflammatory cell recruitment in asthmatic mice in a dose-dependent manner. Lung tissues were collected 24 h after the last aerosol challenge. Further histological examination of H&E stained lung tissues revealed infiltration of inflammatory cells, especially lymphocytes and eosinophils after the OVA aerosol challenge (Fig. 3A and 3B). Treatment with deguelin (4mg/kg) markedly reduced the degree of inflammatory cell infiltration in both peribronchial and perivascular connective tissues as compared with OVA-challenged group (Fig. 3A and 3B). In addition, OVA-challenged mice showed a strong AB/PAS-positive staining in bronchial epithelial tissue, which indicated goblet cell hyperplasia and mucus production (Fig. 3C and 3D). Deguelin (4mg/kg) treatment dramatically reduced goblet cell hyperplasia and mucus secretion as indicated in PAS staining (Fig. 3C, 3D and 3E). A high dose of deguelin (4mg/kg) showed a lower percentage of AB/PAS-positive staining area compared with the low dose of deguelin (1mg/kg) (Fig. 3E). These results indicated that deguelin inhibited OVA-induced lung tissue inflammation and mucus production. To investigate the effect of deguelin on AHR in response to increasing concentrations of methacholine, we measured Penh in response to nebulized methacholine (3.125-50 mg/ml) by whole-body plethysmography. Penh is a calculated unit-less value that correlates the airway resistance, impedance, and intrapleural pressure within the same animal (Penh = pause × peak expiratory box flow/peak inspiratory bow flow). OVA-challenged mice remarkably up-regulated AHR compared to the PBS-challenged mice starting from 6.25 mg/ml of methacholine (Fig. 4). In addition, Penh was significantly reduced in deguelin (4mg/kg)-treated mice as compared with the OVA-challenged group starting from 12.5 mg/ml of methacholine (Fig. 4). The DXM-treated group, used as a positive control, also exhibited significantly reduced Penh values (Fig. 4). These results indicated that deguelin suppressed AHR in asthmatic mice and modified immune-mediated airway pathology in vivo. Deguelin suppressed OVA-induced inflammatory cell recruitment in a dose-dependent manner. Inflammatory cell counts in BALF were obtained from sensitized mice 24 h after the last aerosol challenge. The BALF was centrifuged, and the cell pellets were resuspended and applied to a slide to obtain differential cell counts by Wright staining. Values are shown as mean ± SEM (n = 6 for each group). DXM = dexamethasone. #P<0.05, ##P<0.01 vs. Control group; *P<0.05, **P<0.01 vs. OVA-challenged group; △P<0.05, △△P<0.01 vs. Deguelin (1mg/kg) group. Deguelin inhibited OVA-induced airway inflammation and mucus production. 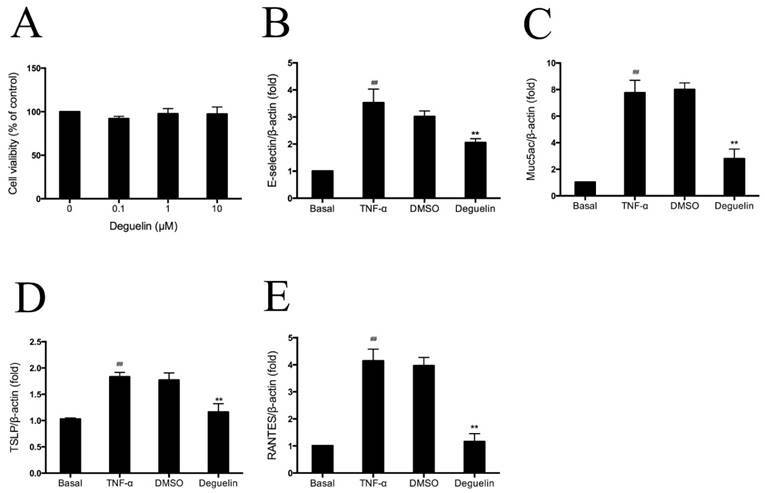 (A, B) 24 h after the final challenge, lung tissues were obtained from controlled mice, OVA-sensitized and challenged mice, deguelin (4mg/kg, 1mg/kg) and dexamethasone (1mg/kg) treated mice. Representative photomicrographs of hematoxylin-eosin (H&E) stained lung sections from each group. (C, D) Alcian blue/periodic acid-schiff (AB/PAS) stained lung sections from each group. (E) The percentage of positively stained epithelial areas (AB/PAS). Arrowed in B2 showed eosinophil. A1-4, magnification ×100; B1-4, magnification ×400; C1-4, magnification ×100; D1-4, magnification ×200. Data are presented as the mean ± SEM (n = 6 for each group). #P<0.05, ##P<0.01 vs. Control group; *P<0.05, **P<0.01 vs. OVA-challenged group; △P<0.05, △△P<0.01 vs. Deguelin (4mg/kg) group. Effects of deguelin on AHR to methacholine in OVA-induced mice. 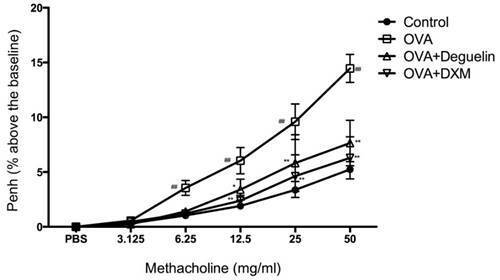 Airway responsiveness of mice in response to aerosolized methacholine was measured 24 h after the last challenge with pretreatment of either deguelin (4mg/kg) or dexamethasone (1mg/kg). AHR was assessed and shown as Penh values. The results were expressed as percentage change in Penh above baseline. Values are shown as mean ± SEM (n = 12 for each group). DXM = dexamethasone. #P<0.05, ##P<0.01 vs. Control group; *P<0.05, **P<0.01 vs. OVA-challenged group. To further evaluate whether deguelin could modify an ongoing OVA-specific Th2 response in vivo, serum levels of total IgE, IgG1, and IgG2a were determined using ELISA. Marked elevation in serum total IgE and IgG1 were observed in OVA-challenged mice as compared with control group (Fig. 5A and 5B). Deguelin at both high and low doses (4mg/ml and 1mg/ml) strongly suppressed IgE and IgG1 levels compared with OVA-challenged group (Fig. 5A and 5B). The high dose of deguelin (4mg/kg) showed a greater suppressive effect than the low dose (1mg/kg) (Fig. 5A and 5B). There was no statistical difference in the level of serum IgG2a (Fig. 5C). Deguelin had effects on the serum levels of IgE and IgG1, not IgG2a, indicating that a specific inhibition of the Th2 response by deguelin in murine asthmatic model. Effects of deguelin treatment on systemic immunoglobulin production in the serum of OVA-sensitized asthmatic mice. Serum was collected 24 h after the last OVA aerosol challenge. The levels of total IgE, IgG1 and IgG2a were analyzed using ELISA. Values are shown as mean ± SEM (n = 6 for each group). Deg 1 = Deguelin 1mg/kg; Deg 4 = Deguelin 4mg/kg; DXM = dexamethasone. #P<0.05, ##P<0.01 vs. Control group; *P<0.05, **P<0.01 vs. OVA-challenged group; △P<0.05, △△P<0.01 vs. Deguelin (4mg/kg) group. Deguelin reduced OVA-induced Th2 cytokine expression in lung tissues. (A, B, C, D) The BALF was collected 24 h after the last OVA aerosol challenge and centrifuged. The supernatants were collected. The levels of IL-4, IL-5, IL-13, and IFN-γ were measured by ELISA. (E, F, G, H) Lung tissues were collected 24 h after the last OVA challenge. Total mRNA was extracted using TRIzol reagent. The gene expression of IL-4, IL-5, IL-13 and IFN-γ were detected by real-time RT-PCR. β-actin was used as an internal control. Values are shown as mean ± SEM (n = 6 for each group). Deg 1 = Deguelin 1mg/kg; Deg 4 = Deguelin 4mg/kg; DXM = dexamethasone. #P<0.05, ##P<0.01 vs. Control group; *P<0.05, **P<0.01 vs. OVA-challenged group; △P<0.05, △△P<0.01 vs. Deguelin (4mg/kg) group. To investigate whether deguelin could modify an OVA-specific Th2 response, Th2 cytokine levels in the BALF were measured by sandwich ELISA. OVA inhalation in sensitized mice caused a notable increase in IL-4, IL-5 and IL-13, as compared with control group (Fig. 6A, 6B and 6C). In contrast, there was no statistical difference in the level of IFN-γ, a Th1 cytokine (Fig. 6D, P>0.05). Deguelin (4mg/kg, 1mg/kg) decreased levels of Th2-associated cytokines including IL-4, IL-5, and IL-13, in OVA-immunized mice (Fig. 6A, 6B and 6C). In addition, Deguelin at 4mg/kg markedly increased IFN-γ level in BALF compared with OVA-challenged group (Fig. 6D). Meanwhile, we collected lung tissues to evaluate gene expressions of Th2 cytokines. The real-time RT-PCR analysis revealed a significant decrease in the expression of Th2 cytokines, including IL-4, IL-5, and IL-13 in deguelin (4mg/kg, 1mg/kg) group compared with OVA-immunized group (Fig. 6E, 6F and 6G). Deguelin at 4mg/kg increased the expression of IFN-γ (Fig. 6H). Moreover, the reduction of cytokine IL-5 and IL-13 was in a dose-dependent manner in asthmatic mice (Fig. 6B, 6C, 6F and 6G). These results implied that deguelin suppressed the Th2-predominant immune activity in OVA-induced murine asthmatic model. To further evaluate effects of deguelin on inflammatory gene expression in asthmatic mice, we measured the expression of inflammation-associated gene in lung tissues by real-time RT-PCR. The mRNA levels of E-selectin, Muc5ac, iNOS and thymic stromal lymphopoietin (TSLP), which are essential for allergic airway inflammation and mucus secretion, markedly increased in OVA-challenged mice as compared with PBS-challenged control (Fig. 7A, 7B, 7C and 7D). Deguelin (4mg/kg and 1mg/kg) significantly suppressed expressions of E-selectin, Muc5ac, iNOS, and TSLP in the allergic airways (Fig. 7A, 7B, 7C and 7D). The high dose of deguelin (4mg/kg) showed a greater suppressive effect than the low dose (1mg/kg) (Fig. 7B, 7C and 7D). Since TSLP plays a pivotal role in T-cell maturation and Th2 induction in asthma , we further investigated expression of TSLP on CD4+ T cells by flow cytometry. Fresh lung tissues were collected 24 h after the last aerosol challenge. Cells purified from lungs were resuspended and stained with FITC-conjugated anti-CD4 and APC-conjugated anti-TSLP Receptor. OVA challenge significantly increased TSLP expression on CD4+ T cells compared to PBS group (Fig. 7E and 7F). Deguelin dramatically decreased the level of TSLP expression in a dose-dependent manner (Fig. 7E and 7F). Taken together, deguelin dramatically reduced OVA-induced inflammatory gene expression in asthmatic model. Among the numerous intracellular signaling networks involved in the differentiation of T cells, the NF-κB pathway has emerged as an important contributor to this developmental process . As mentioned earlier, deguelin has been reported to down-regulate TNF-α induced NF-κB activation in different kinds of cells. To further explore the anti-inflammatory mechanisms of deguelin in airways, we performed experiments on TNF-α induced inflammatory gene expression in normal human bronchial epithelial cells (BEAS-2B). Since cytokines of the TNF family trigger a variety of NF-κB-dependent responses that can be specific to both cell type and signaling pathway , and the mechanism of NF-κB activation is relatively well established, we investigated the effect of deguelin on TNF-α induced NF-κB activation in BEAS-2B cells. Before addressing the effect of deguelin on the TNF-α induced inflammatory gene expression in BEAS-2B cells, we measured cell viability after deguelin treatment for 24 h. As a result, deguelin showed no cytotoxicity at concentrations less than 10μM (Fig. 8A). Subsequently, BEAS-2B cells were pre-incubated with deguelin (10μM) for 24 h, and then stimulated with TNF-α (10 ng/ml) for 30 min. DMSO was used as a negative control. The mRNA expression of E-selectin, Muc5ac, TSLP, and RANTES were evaluated by real-time RT-PCR. Deguelin noticeably blocked TNF-α-induced expression of E-selectin, Muc5ac, TSLP, and RANTES in BEAS-2B cells compared with control group (Fig. 8B, 8C, 8D and 8E). These results indicated that deguelin reduced NF-κB-associated inflammatory gene expression in BEAS-2B cells as similar with lung tissues which was described before. To further explore mechanisms of deguelin, we first investigated effects of deguelin on NF-κB activation in mice with OVA-challenged asthma. Total protein, cytosol protein, and nuclear protein were separately extracted from lung tissues 24 h after the last aerosol challenge. The expression level of NF-κB p65 and IκBα were analyzed by Western Blot analysis. Our data showed that IκBα were degraded in OVA-challenged mice (Fig. 9A and 9B). OVA stimulation induced the phosphorylation of both p65 and IκBα (Fig. 9A, 9C and 9F), and induced the translocation of p65 into the nucleus (Fig. 9E, 9G and 9H). Deguelin (4mg/ml) attenuated the phosphorylation of IκBα and p65, and decreased the nucleus level of p65, with the increase of the cytoplasmic level of p65 (Fig. 9A, 9C and 9E-H). The total NF-κB p65 subunit showed similar patterns as p-p65 (Fig. 9A, 9D and 9F). To further assess effects of deguelin on TNF-α induced NF-κB activation in vitro, we examined total NF-κB p65, IκBα, the phosphorylation of p65, and IκBα in BEAS-2B cells, using Western Blot analysis. As a result, TNF-α induced a rapid phosphorylation of p65 and IκBα, leading to a degradation of IκBα (Fig. 10). However, deguelin markedly inhibited the TNF-α induced phosphorylation of p65 and IκBα, and suppressed the degradation of IκBα (Fig. 10A, 10B, 10C and 10D). Furthermore, we found that TNF-α induced the translocation of p65 into the nucleus in BEAS-2B cells, which was inhibited by deguelin (Fig. 10A and 10F). These results confirmed that deguelin inhibited TNF-α induced translocation of p65 to the nucleus by suppressing phosphorylation of p65 and IκBα in cytoplasm, leading to reduced NF-κB activity in epithelial cells. Deguelin reduced OVA-induced inflammatory gene expression in lung tissues. (A, B, C, D) Lung tissues were collected 24 h after the last OVA challenge. Total mRNA was extracted using TRIzol reagent. The gene expression of E-selecitn, Muc5ac, iNOS and TSLP were detected by real-time RT-PCR. β-actin was used as an internal control. (E) Lung tissues were collected 24 h after the last OVA challenge. Single-cell suspensions prepared from lung tissues were double-stained with FITC-conjugated anti-CD4 and APC-conjugated anti-TSLP Receptor, and were analyzed by flow cytometry and software FlowJo 7.6. (F) Ratios of TSLP+/CD4+ T cells were presented. Values are shown as mean ± SEM (n = 6 for each group). Deg 1 = Deguelin 1mg/kg; Deg 4 = Deguelin 4mg/kg; DXM = dexamethasone. #P<0.05, ##P<0.01 vs. Control group; *P<0.05, **P<0.01 vs. OVA-challenged group; △P<0.05, △△P<0.01 vs. Deguelin (4mg/kg) group. Effects of deguelin on TNF-α induced inflammatory gene expression in BEAS-2B cells. (A) BEAS-2B cells were incubated in the presence or absence of different concentrations of deguelin for 24 h. Cell viability was measured with CCK-8 assay. (B, C, D, E) Cells were pretreated with 10 μM deguelin for 24 h and subsequently treated with 10 ng/ml TNF-α for 30 min. Total mRNA was extracted using Trizol reagent. The effects of deguelin on the mRNA expression of E-selectin, Muc5ac, TSLP, and RANTES were measured by real-time RT-PCR. DMSO was used as a negative control. β-actin was used as an internal control. Values are shown as mean ± SEM of three independent experiments. DMSO = dimethyl sulfoxide. #P<0.05, ##P<0.01 vs. Basal group; *P<0.05, **P<0.01 vs. TNF-α-induced group. Deguelin suppressed OVA-induced NF-κB activation in lung tissues. Total protein, cytosol protein and nuclear protein were separately extracted from lung tissues 24 h after the last OVA challenge. (A) Expressions of NF-κB p65, phospho-p65, IκBα, and phosph-IκBα were analyzed by western blotting analysis. β-actin was used as an internal control. (E) Expressions of cytosol p65 and nuclear p65 were analyzed by western blotting. β-actin and Lamin B were used as internal controls. (B, C, D, F, G, H) Grey values of the indicated proteins were measured by Quantity One software. Values are shown as mean ± SEM (n = 6 for each group). DXM = dexamethasone. #P<0.05, ##P<0.01 vs. Control group; *P<0.05, **P<0.01 vs. OVA-challenged group. Effects of deguelin on TNF-α induced NF-κB activation in BEAS-2B cells. BEAS-2B cells were pretreated with 10 μM deguelin for 24 h and then exposed to 10 ng/ml TNF-α for the indicated times. (A) Expressions of NF-κB p65, phospho-p65, IκBα, phospho-IκBα and nuclear p65 were analyzed by Western Blotting analysis. β-actin and Lamin B were used as internal controls. (B, C, D, E, F) Grey values of the indicated proteins were measured by Quantity One software. Values are shown as mean ± SEM of three independent experiments. #P<0.05, ##P<0.01 vs. Medium plus TNF-α-10 min group; *P<0.05, **P<0.01 vs. Medium plus TNF-α-30 min group. 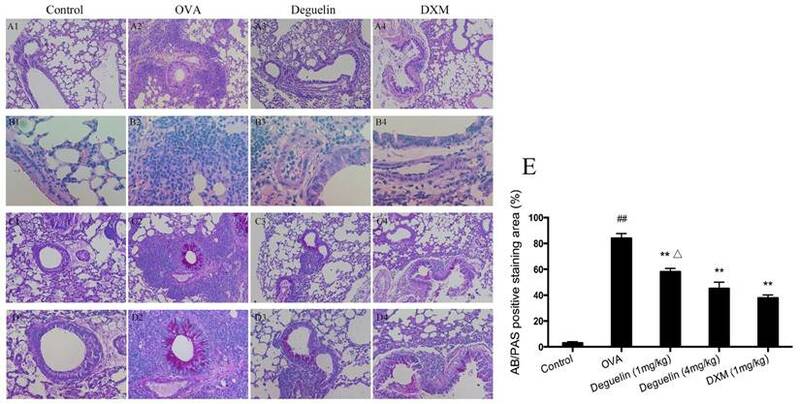 In this study, we have shown that deguelin effectively reduced OVA-induced infiltration of inflammatory cells, mucus production, AHR, and expression of immunoglobulin and Th2 cytokines in asthmatic mice. In addition, we found that deguelin reduced inflammatory gene expressions both in vivo and in vitro, which were closely associated with activation of the NF-κB signaling pathway. Thus, we further explored the underlying mechanisms of deguelin in BEAS-2B cells. We found that deguelin inhibited the phosphorylation of IκBα and p65 in BEAS-2B cells, leading to suppression of the NF-κB-associated inflammatory cascade. To our knowledge, it was the first time to investigate the anti-inflammatory effects of deguelin in a mouse model of bronchial asthma and deguelin may be a potent therapeutic agent for asthma. The eosinophil is a fully delineated granulocyte that disseminates throughout the bloodstream to end organs after complete maturation in the bone marrow. While the presence of eosinophils is not uncommon even in healthy individuals, these granulocytes play a central role in the pathogenesis of allergic inflammation, particularly in the respiratory system, such as asthma . Results of our study showed that after sensitization and challenge with OVA, the number of total inflammatory cells, eosinophils, macrophages and lymphocytes increased significantly in BALF. Deguelin treatment noticeably prevented inflammatory cell infiltration into the airways as showed by a significant decrease in total cell counts, eosinophils and macrophages in a dose-dependent manner. The histological examination of H&E stained lung tissues revealed infiltration of inflammatory cells, such as lymphocytes and eosinophils after the OVA-challenge. OVA-challenged mice also showed a strong AB/PAS-positive staining in bronchial epithelial tissue, indicating goblet cell hyperplasia and mucus production. Our date showed deguelin treatment significantly alleviated inflammatory cell infiltration, goblet cell hyperplasia, and mucus production. Th2 cytokines induce the changes in the airways and lung parenchyma that are associated with asthma includes airway eosinophilia, pulmonary lymphocytosis and mastocytosis, alternative macrophage activation, epithelial cell proliferation with goblet cell hyperplasia, increased mucus secretion, smooth muscle hyperplasia, hypertrophy and hypercontractility, subepithelial fibrosis, IgE secretion, and increased production of chemokines that attract T cells, eosinophils, neutrophils and mast cells or their precursors to the lungs . IL-4, IL-5, and IL-13 can be produced by various lung resident cells, such as bronchial epithelial cells, tissue mast cells, and alveolar macrophages, as well as infiltrated inflammatory cells, such as lymphocytes and eosinophils. It is well known that alternations in cytokines, with over production of Th2 cytokines (IL-4, IL-5, and IL-13) in concert with reduction of Th1 cytokines (IFN-γ), play central roles in pathogenesis of asthma . Our present results showed increased levels of IL-4, IL-5, and IL-13 in OVA-challenged group in BALF. Deguelin significantly reduced the levels of Th2 cytokines (IL-4, IL-5 and IL-13) in a dose-dependent manner. However, there was no significantly difference in IFN-γ. Both ELISA and RT-PCR revealed similar results. These results suggested that deguelin induced a shift from a Th2-skewed response to a balanced Th1/Th2 response, inhibiting the asthmatic inflammation. AHR has been used in epidemiological studies as a useful marker of airway abnormalities in asthma, and it is a predictor of the subsequent course of the disease . It is believed that inflammatory mediators released during the allergic inflammation play a critical role in AHR development . It has been reported that IL-4 and IL-13 play critical roles in the development of AHR[23, 24], and IL-5 can induce AHR by mobilizing and activating eosinophils, leading to the release of proinflammatory products, which are closely associated with AHR . In our study, we demonstrated that deguelin significantly ameliorated OVA-induced AHR to increasing concentrations of methacholine. These were in accordance with our hypothesis that deguelin reduced Th2 cytokine production. Elevated serum IgE level is a hallmark of the Th2 immune response. IgG1 has been used as a Th2 marker and is correlated with IgE levels . Total IgE and IgG1, but not IgG2a levels predicted murine antigen-specific responses . Deguelin strongly suppressed the serum levels of IgE and IgG1, not IgG2a, indicating that a specific inhibition of the Th2 response by deguelin in murine asthmatic model. Thus, the observed reduction of AHR by deguelin may be associated with reduction of Th2 cytokine production and serum immunoglobulins levels. TSLP is an epithelial-cell-derived cytokine that is important in initiating allergic inflammation. It plays a key role in allergen-induced airway responses and persistent airway inflammation in patients with allergic asthma . In addition, TSLP controls allergic Th2 inflammatory responses through induction of distinct activation programs in dendritic cells (DCs) . A novel double-blind, placebo-controlled study revealed that treatment with AMG157, a human anti-TSLP monoclonal immunoglobulin, reduced allergen-induced bronchoconstriction and indexes of airway inflammation before and after allergen challenge . We have reason to believe that TSLP plays a key role in allergen-induced airway responses and persistent airway inflammation, especially in allergic asthma. Our date showed that deguelin markedly reduced both the mRNA expression and protein production of TSLP in the lungs of OVA-challenged mice by RT-PCR and flow cytometry analyses. These dates indicated that deguelin alleviate allergen-induced airway inflammation through TSLP signaling mechanisms, which need to be further unraveled. As we have mentioned before, E-selectin is an important adhesion molecule for pulmonary recruitment of inflammatory cells such as eosinophils, which expressed only on endothelial cells activated by cytokines . Muc5ac, which is essential for mucus hypersecretion, is a major mucin protein secreted from the airway surface epithelium and its expression is markedly upregulated in lung tissue in OVA-induced asthmatic mice [31, 32]. iNOS, a pro-inflammatory enzyme responsible for NO production in allergic airway inflammation, is involved in the pathogenesis of inflammation and cancer inflammation . RANTES, also known as CCL5, is one of the cytokines orchestrating leukocyte transmigration into the airways in combination with adhesion molecules, such as E-selectin . We have demonstrated that deguelin markedly downregulated the mRNA expression of E-selectin, Muc5as, and iNOS in the lungs of OVA-challenged mice. Our date also has shown that the suppression of Muc5as, E-selectin and RANTES mRNA expression in TNF-α-stimulated BEAS-2B cells. Our results are similar to those of other previous published studies. Interestingly, E-selectin contains the κB site for NF-κB within their promoters. Previous studies reported that inflammatory cytokines, like TNF-α, induce Muc5ac gene expression through activation of the NF-κB pathway in the lung epithelial cells . NF-κB increases the expression of the genes encoding pro-inflammatory cytokines and enzymes like iNOS and RANTES [36-38]. In addition, TSLP is also regulated by NF-κB together with some important cytokines . Taken together, we considered the observed reduction of airway inflammation by deguelin be a result of combined inhibitory effects of associated cytokines and adhesion molecules, which was closely related to inhibition of NF-κB activation. Inflammation is the process of innate immunity in response to physical, physiological and/or oxidative stress and is associated with activation of the canonical NF-κB signaling pathway, which is conserved in all multicellular animals . Persistent NF-κB activation has been observed in allergic airway inflammation both in human and in animal models . Futhermore, NF-κB induces cytokines that regulate the immune response, as well as adhesion molecules, which lead to recruitment of leukocytes to sites of inflammation . In addition, TNF-α stimulation of airway epithelial cells triggers NF-κB-dependent gene expression [42, 43]. It has been reported that the suppression of TNF-induced NF-κB activation by deguelin occurred through the inhibition of the activation of IκBα kinase, leading to suppression of IκBα phosphorylation, IκBα degradation, p65 phosphorylation, p65 nuclear translocation in tumor cells . To confirm the mechanism of the reduction of OVA-induced inflammation in mice through treatment of deguelin, we assessed the potential effects of deguelin on the activation of NF-κB. Our Western Blot analysis revealed that deguelin suppressed the phosphorylation of p65 and decreased the nucleus level of p65 in lungs in OVA-challenged mice. In addition, our results showed that deguelin inhibited the phosphorylation of p65 and IκBα, suppressed the translocation of p65 into the nucleus, and the degradation of IκBα in TNF-α-stimulated BEAS-2B cells in vitro. We have confirmed that during the progression of inflammation, deguelin potentially inhibited NF-κB binding activity by preventing the translocation of NF-κB p65 into the nucleus, and enhanced the ability of IκBα to maintain NF-κB in an inactive form in the cytoplasm. In summary, our results demonstrated that deguelin effectively reduced OVA-induced inflammatory cell recruitment in BALF, decreased inflammatory cell infiltration and mucus production in lungs, suppressed AHR, and inhibited serum immunoglobulin and Th2 cytokines in asthmatic model. In addition, deguelin suppressed inflammatory gene expressions both in vivo and in vitro. Furthermore, deguelin prevented phosphorylation of IκBα and p65 and suppressed translocation of p65, leading to inactivation of NF-κB signaling pathways in lung epithelial cells. Our findings suggest deguelin may be a potential therapeutic drug for patients with allergic airway inflammation. The authors thank Professor Qiangmin Xie (Zhejiang Respiratory Drugs Research Laboratory of SFDA of China, School of Medicine, Zhejiang University) for providing the Whole Body Plethysmograph System. This study was supported by Zhejiang Provincial Natural Science Foundation (No: LY14H010002) and Project of Health and Family Planning Commission of Zhejiang Province, China (No: 2014KYB8098). Corresponding author: Prof. Jianying Zhou, Department of Respiratory Diseases, The First Affiliated Hospital, School of Medicine, Zhejiang University, 79 Qingchun Road, Hangzhou 310003, Zhejiang Province, China. Tel/fax: +86 571 8723 6876; E-mail: zjyhzedu.cn.